So I'm coding all the time. As a result, I find it somewhat hillarious that my github stats don't show it, mostly because I do a lot of my coding on private repositories not on Github. In fact, as of late, I'm thrilled to be using my own GoGS server. It runs great on one of my raspberry pis. Last night (this morning?) I forked a repository of an npm package I'm using in one of my projects. I needed some new features added to it to make it work with the project, so I coded them. The work spreads across 4 commits. It wasn't much, and the commit to fix the tests didn't work because the original author wrote tests that assumed a specific timezone, so this wasn't yet pull request material. To keep it simple, I put the commits on the master branch and simply point my project at my fork instead of the released versions of the project. Later, after some sleep, I started researching base for my fork only to realize that the author hasn't even looked at pull requests since July of 2015. So I looked at some other forks, and considered basing my potential pull request off of a more recent version. Instead of just doing that and abandoning what is definitely the basis for the project on npm, as a courtesy to the author I posted an issue that the project appears to be dead and asked if we should redirect to a more active fork. So, naturally, I expected Github to track my activity and show it in my contributions page. 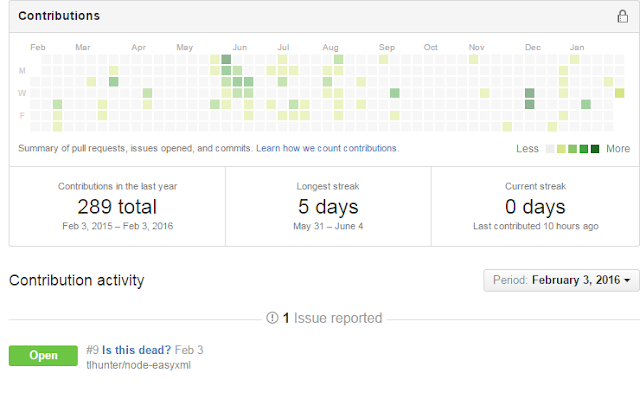 I noticed a few months back that github doesn't put anything on your contributions page if you are working on a branch that isn't "master" which must be annoying for people who don't use master as their main branch, but I can understand it and it results in "eventual" consistency with contributions showing up when your branch is merged into master. But that seems silly. What's worse, I noticed when I left my last job, that when you leave a team, your contributions to that team's private repositories no longer show up on Github either, but I guess I get that too...to the same extent. As of a few weeks ago, I noticed that issues showed up as contributions on this display. I can understand that issues are important, but to track them while not tracking actual commits....whatever I guess. All of that helps it make more sense when you see that, even though my contributions are to a public repository on the master branch, they don't show up because the repository's a fork...But then I realized something extremely unpleasant. Leave aside the fact that this encourages people to spam meaningless issues onto every repository they can find. I'd like to remind you instead that: I'm using the forked repo in production. That means that the information that github is showing is actually the opposite of what contributions I've made to software development today. I don't know what to say. Maybe I'm using github wrong. Let me know if you think so. Otherwise, feel free to share your own github stories. What's weird about github to you?.